Coverage area 13 Kg/cm2 @ 4 - 5mm Thk. Backed by advanced processing setup, we are able to manufacture and export top class Steel Putty For Metal Surface Repairs. It is a steel-filled, non-sagging epoxy which is widely used to provide a metal like finish. The Steel Putty is high in demand for making cost saving repairs on metal parts under typical service temperatures. One of the most recommended general purpose epoxy compounds. This Steel Repair Putty is ideal for Sealing Cracked Castings, Tanks, Vessels and Valves. We offer this putty to clients in excellent packing at competitive price. To repairing and prevention of metallic parts we are producing different composition of Putty for Surface Renewal & Maintenance, Leak Seal & Machine able purpose. To repair machinery parts, Leak Seal & Surface prevention purpose. Where Solutions For Abrasion & Corrosion Arise. 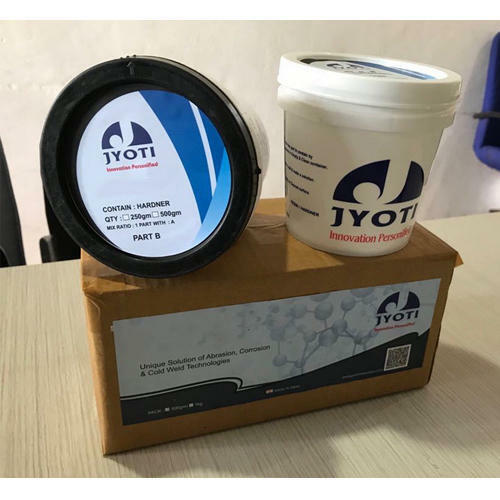 We “Jyoti Innovision Pvt Ltd” are an eminent entity involved in manufacturing and exporting an excellent range of High Alumina Ceramic Tiles, Ceramic Pulley Lagging, Mill Discharge Valve, Epoxy Adhesive, Ceramic Liner, Ceramic lined parts, Sleeve, Mechanical seal, Plungers, Technical ceramic products, etc and engaged in offering Coating Services for corrosion & Abrasion. Our Company Incorporated in the year 2012 at Ahmedabad (Gujarat, India), we are involved in offering an exquisite array of high quality products. Our mentor, “Mr. Yogesh Gohil” (Director), has immense experience in this industry and under his worthy guidance we have achieved a prominent position in this industry. We are exporting our products in different countries like Australia, Iraq, Dubai, Singapore, Vietnam, Malaysia, Africa etc.